The AR-DV10 is the worlds most advanced wide-band 100kHz-1300MHz, multi-mode, SDR receiver. It supports a variety of digital and analog modes in the Amateur radios bands, Aircraft band, Marine band and Commercial bands. 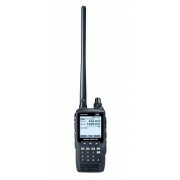 The AR-DV10 is capable of receiving analog (CW/SSB/AM/FM) in all the Amateur Radio bands. In additionl to the analog modes, the AR-DV10 affords reception of high-quality C4FM digital audio, and numerous other digital protocols for commercial radio such as DMR and P25.